Siem Reap Province is located in northwestern Cambodia. This is a major Cambodia tourist destination, as it is the closest city to the world-famous temples of Angkor (the Angkor complex in the north of the city). The capital is also called Siem Reap and is located in the south of the province on the shores of Tonle Sap Lake, the largest freshwater preserve in Southeast Asia. The name of the city literally means that Siamese was defeated, referring to the victory of the Khmer Empire in the army of the kingdom of Thailand in the 17th century. 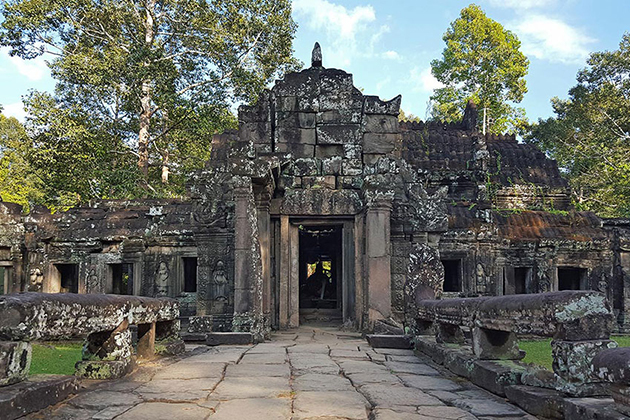 This is the list of 10 incredible temples in Siem Reap that you must visit in your Angkor Wat itineraries as well as Cambodia tours. Visiting the Angkor Wat is definitely the first experience that tourists think of during their Cambodia itineraries. Angkor Wat is a famous architectural complex of the ancient Khmer. It attracts tourists from all over the world. Entrance to the temple is a stone path, crossing a large moat. The first feature is the stretch of rock corridor, covering the yard of green trees. Although Siem Reap hot weather, you will feel comfortable with the view of trees and lakes here. From the campus, you can see tall towers. These towers are characteristic of Angkor Wat, which can be seen from afar. From the various small blocks of stone, Khmer people arranged and attached them in a subtle way. Besides, they also deftly decorate beautiful patterns, and the reliefs are shaped as gods. The central part of Angkor is the 60m high shrine which is the highest of the architectural complex. To get to this place, you have to go through many doors, climb all the high platforms, and cross a wide yard. You will really feel excited when you reach this peak. This is a sacred place, so the tourists wearing skirts or pants sort will not be allowed to climb. Angkor Wat is one of the most famous ancient buildings in the world, the remains of the ancient Khmer civilization. The cost and time you have to pay to visit this place are not much, but the experience that the Angkor Wat tour brings is very rich. Angkor Thom is located in the Angkor Wat complex. Next to the mighty Angkor Wat, Angkor Thom is equally mysterious to attract large numbers of Cambodia tourists. Angkor Thom – the last great capital of the Angkor Empire, is one of the most beautiful, ancient place and pride of the Cambodian. Angkor Thom was built to be the capital city of Jayavarman VII and was at the center of his massive construction program. A plaque found in the city has written about Jayavarman VII as the groom and Angkor Thom as his bride. 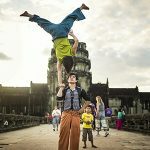 Coming to Angkor Thom, you will be like a strange world filled with incredible listening to interesting historical stories associated with the construction of it. 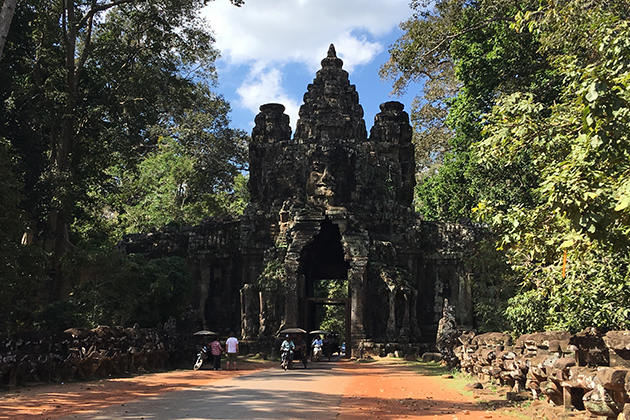 The entrance to Angkor Thom is impressive: the two sides of the body of the snake body of seven heads, a few hundred meters long along the door to this ancient city. Angkor Thom city center is Bayon temple with four gates in four directions. The cost of visiting Angkor Thom is included in the ticket you purchase to visit the Angkor Wat. It is best to buy a three-day visit ticket for $ 62 to have time to explore the entire Angkor population. A one-day trip costs $ 37 and a week is $ 72. The temple visit is 5:00 – 5:30 pm and the ticket office is about 2 km from Angkor Wat, remember to keep your ticket at all times and in good condition. You are allowed to come and go freely during the opening hours. Getting to the sun or watching the sunset in Angkor Thom will be one of the best things you can experience in your Siem Reap tour, do not forget to fully charge the camera battery to save the most beautiful moments in this ancient capital. Ta Prohm is a famous temple but ruined and is a popular Cambodia tourist attraction because of the great tree roots like the giant python crawling on the stone. Ta Prohm is located to the east of Angkor Thom, which is 700 meters wide and up to 1 km long, using a variety of precious stones, diamonds, and five thousand gold coins, plus five thousand dollars worth of silver to build this temple. According to the original design, this temple represents Prajnaparamita – meaning wisdom, a model of construction commemorating and worshiping the mother of the late Empress Dowager Jayarajachudanami. After the Khmer dynasty collapsed, the Ta Prohm temple was forgotten until the early twentieth century, the temple was re-discovered with the status quo as originally built: ruins with ancient trees, surrounded by tropical forests, this factor helps Ta Prohm become the most popular Angkor tourist destination in Cambodia tours. Bayon is a well-known Khmer temple in Angkor, Cambodia. Built in the late 12th or early 13th century as the official temple of King Mahayana, King Jayavarman VII, Bayon is located in the heart of the capital city of Angkoravarman, Angkor Thom. After Jayavarman’s death, it was modified by later Hindu and Theravada kings according to their own religious preferences. 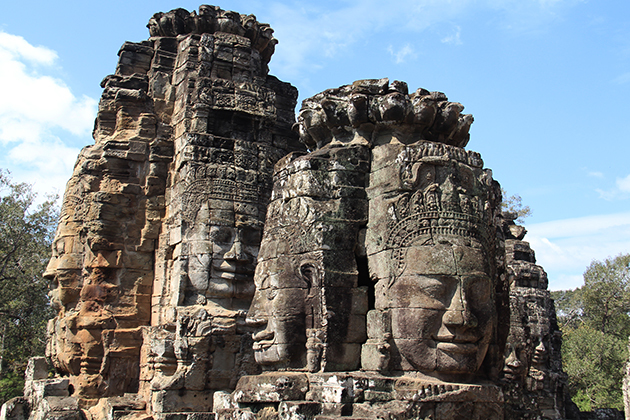 The most striking feature of Bayon is the countless peaceful faces and smiles on the towers. The temple is also known for its two impressive sculptures, showing the unusual combination of legendary, historical and secular scenes. The Japanese Government Group on the Safeguarding of Angkor has described the Bayon temple as “the most prominent manifestation of the baroque style” of all Khmer architecture. 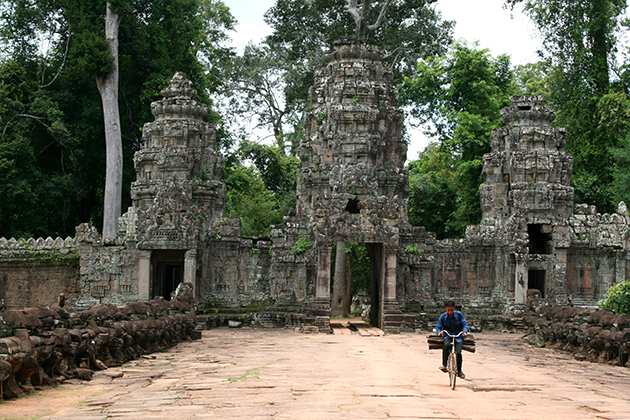 Takeo is a famous temple complex in the Angkor Thom complex, built as a shrine to Shiva. This temple has not been completed yet. The temple was built by Jayavarman V in 977 when the building was about to be completed, the stones were ordered but not carved, but stopped because the temple was struck by lightning, should be considered a bad omen. At the same time as the internal war took place to win the crown, King Jayavarman V had died. Therefore, the construction of Takeo temple has stopped construction, however, the temple still has been distinctly stable. 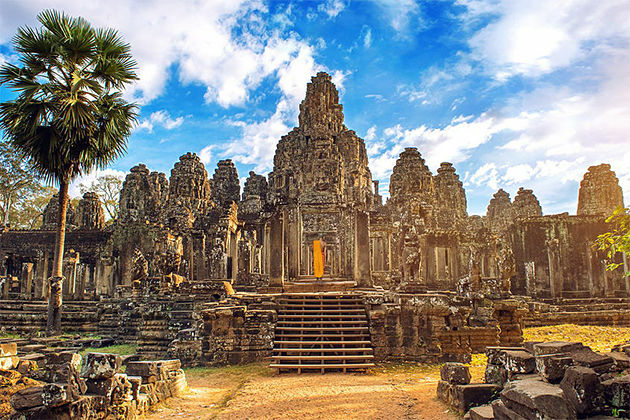 The temple was abandoned and did not worship a god because the temple was not completed, until the Khmer Empire broke down and deserted Angkor Thom, the Takeo temple also sank into the past with Angkor Thom. When Angkor Thom was discovered and restored, the Takeo Temple was restored and put into operation for the tourism industry. Ta Keo is the temple that represents Mount Meru – the source of Hindu deities. The construction materials are mainly Khmer stone, Zigurrat style architecture with two high walls surrounded. Visitors can go upstairs by steps from four sides. The highest floor is designed to build five temples, with four sub-towers at four corners and a central tower. 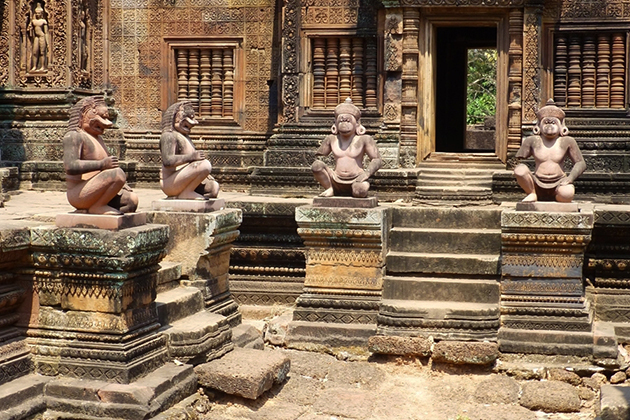 Banteay Srei is a 10th-century Cambodia temple dedicated to Hindu Shiva god. Located in the Angkor area, it is located near Phnom Dei Hill, 25 km (16 miles) northeast of the main temple group that once belonged to the medieval capital of Yasodharapura and Angkor Thom. Dedicated on April 22, 967, it was the only main temple in Angkor not built by a king. It was built primarily of red sandstone, a vehicle for itself to carve intricately decorated walls that are still observed today. The buildings themselves are miniaturized, so abnormal when measured by the standards of Angkor’s construction. These factors have made the temple be a popular tourist destination in Cambodia itineraries, and have led to it being widely hailed as a “jewel”, or “jewel of the Khmer art”. Banteay Kdei, which means “A Citadel of Chambers”, also known as the “Citadel of Monks’ cells”, is a Buddhist temple in Angkor, Cambodia. It lies southeast of Ta Prohm and east of Angkor Thom, built in the mid-12th century to the early 13th century after the reign of King Jayavarman VII, is of Bayon architecture, similar to the Ta Prohm and Preah Khan plans, but less complicated and smaller. Its structure is contained in two continuous surrounding walls and consists of two concentric galleries which emerge before the tower by a monastery. This Buddhist monastery complex is currently in ruins due to faulty construction and poor sandstone quality used in its buildings. Banteay Kdei was occupied by monks for various periods of time through the centuries until the 1960s. 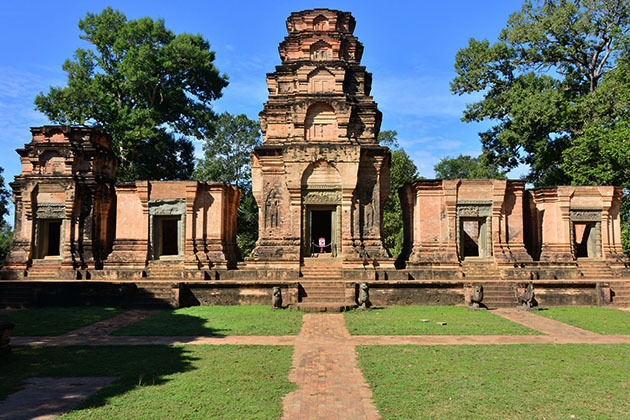 Prasat Kravan is a small 10th-century temple with 5 red brick towers on a shared terrace, located in Angkor, Cambodia, south of the artificial lake called Srah Srang. The temple was dedicated to Vishnu in 921 CE. It heads east and is surrounded by a small moat. The exterior of the temple stands out with its classic lines and symmetry. The central and the south tower have a superstructure that takes advantage of the misalignment angle by simplifying the means of decaying floors. The interior of the reserve is remarkable for the great relief descriptions of Vishnu and Lakshmi that have been carved into the red brick walls, which are connected by a plant compound. 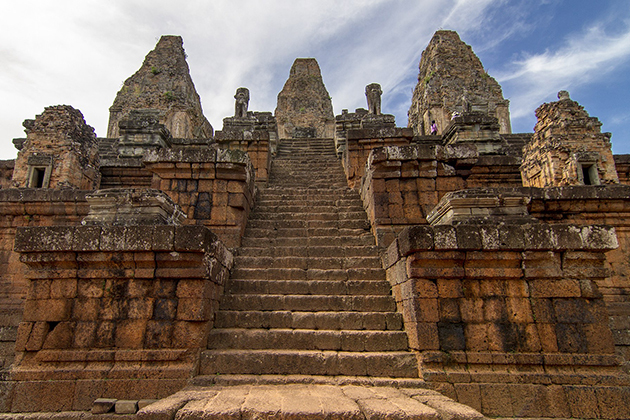 Pre Rup Temple was built in 961, during the reign of King Rajendravarman. This is a temple dedicated to the god Shiva in Hinduism. When climbing up to the 12-meter tower, visitors will observe the 360 ° panorama of the jungle surrounding. In the early morning or evening, the scenery here is impressive. However, the stairs are very high and steep. 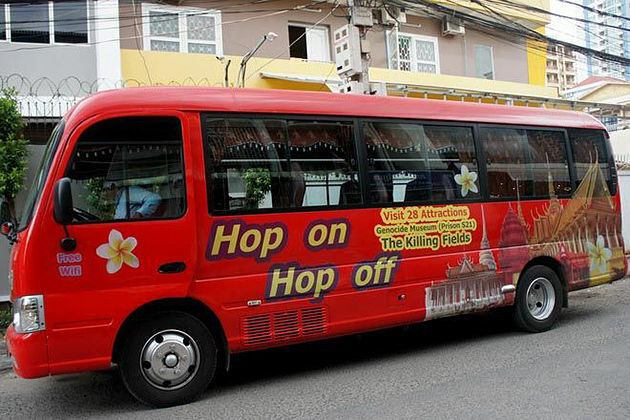 It will be an interesting challenge for tourists. But if you are afraid of heights do not try this. This temple is also an ideal place for tourists to watch the sunset. 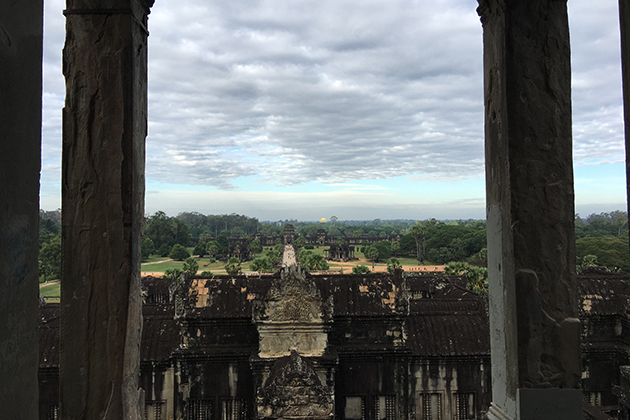 The image of the Pre Rup temple sunk in the sunset will create an attraction, which makes visitors immediately take photos to save that moment. Watching the sunset from the top of Pre Rup temple would be a memorable experience on your Cambodia vacation. 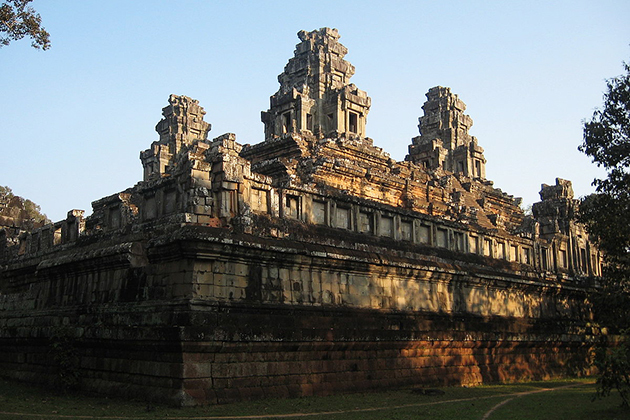 Preah Khan is an Angkorian temple built in the 12th century for King Jayavarman VII to honor his father. It is located northeast of Angkor Thom and west of Jayatataka Baray, with which it was associated. 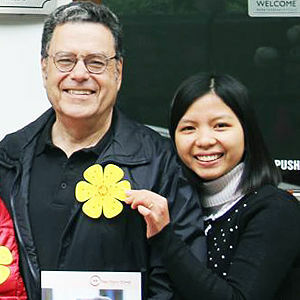 It is the center of a remarkable organization, with nearly 100,000 cadres and civil servants. The name of the temple, which means “holy sword”, is derived from the meaning of the original – Nagara Jayasri (holy city of victory). The temple is flat in design, with a basic plan of rectangular galleries in a row around a complex Buddhist sanctuary by Hindu satellite temples. Like Ta Prohm nearby, Preah Khan has been left largely unrestored, with many trees and other vegetation growing in ruins. • If you buy a ticket after 4:45 pm, it is free to enter the temple that evening before the ticket starts the next day – to enjoy the sunset for free. Opening hours of the temples: 5 am – 6 pm. (Banteay Srei closed at 5 pm). – Go in the offseason. The peak season to visit Angkor Wat is during the cooler months of November to March. April and May are unbearably hot but you can visit the rainy season (June-October) to enjoy the cheaper, less crowded, and surprisingly rural green tasting. – Arrive Early. If you want to watch the sunrise in Angkor Wat, come early to have a good view or sit further or to the side to get some peace from the crowd near the pond. Most tourists return to the hotel for breakfast after sunrise, so after sunrise is the best time to explore Angkor Wat. If you’ve seen the sunrise in Angkor it’s still worth getting there early (the complex opens at 5 am and closes at 6 pm). • Take your time. Just 1 day Angkor Wat itinerary will not be enough to explore this world’s most famous complex. 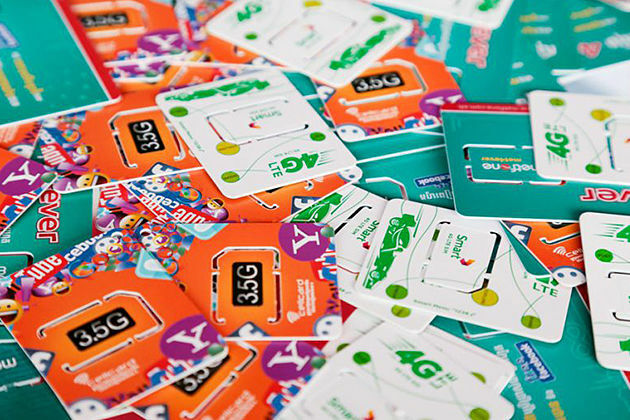 Spending 2-3 days may be enough. And do not think once you have seen a temple you have seen all because there are so many styles and levels of decay that mean every temple has something different to see. We hope the information we provide will help you have a perfect Siem Reap itinerary and Cambodia itinerary as well.